By simulating a low-impact collision, the Seat Belt Convincer can greatly impact how participants value the importance of wearing a seat belt. The system enables a passenger to experience the actual force generated during a 5-10 mph collision. After this experience, passengers realize the value of the restraint provided by the seat belt and gain a new respect for the protection that seat belts can provide. The passenger enters the carriage at the top of the slide and buckles into the seat. Once the rider is properly fastened in the seat belt and its fitment is double-checked, the operator rotates the lever from the "return" position to the "convince" position. The secured rider slides down the track and collides with the front bumpers, safely experiencing a simulated crash. After impact, the rider exits the machine at the bottom. The Convincer is then returned to the top of the carriage in preparation for the next rider. The Convincer was developed to educate the general public of how beneficial the use of seat belts can be even when involved in a low speed collision. 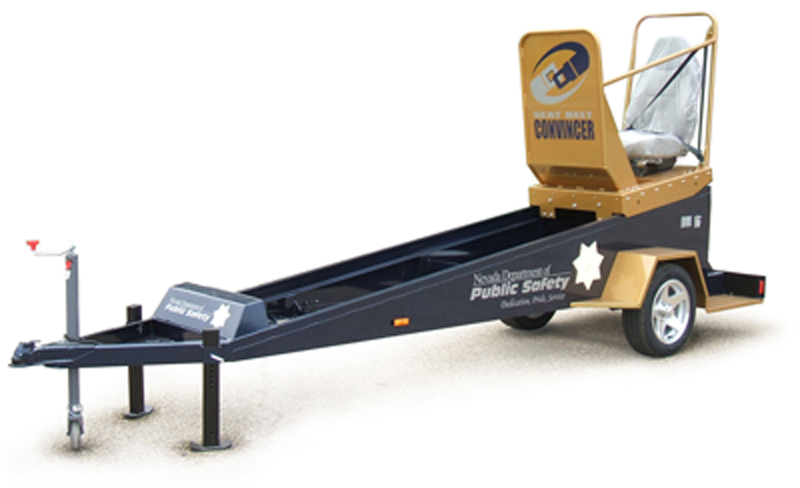 It is a very effective tool for safety presentations at high schools, businesses, fairs, community events, drivers' education programs or any event where the "entertainment" and safety education factors associated with the Convincer would be of benefit. It allows the rider to experience the surprising amount of force generated with such a low speed collision and to gain respect for the benefit that a seat belt can provide.